Climate change is affecting high mountain ecological systems at the Niwot Ridge site west of Boulder. 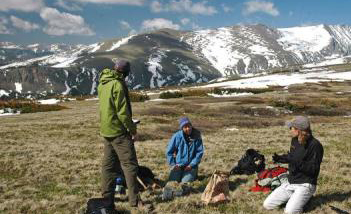 Ecosystems dependent on seasonal snow and ice are most sensitive to climate change and Colorado is impacted, according to papers published in the journal BioScience about ecological changes at Long-Term Ecological Research sites, including CU-Boulder’s Niwot Ridge. The site west of Boulder includes several thousand acres of subalpine forest, tundra, talus slopes, glacial lakes and wetlands and reaches an elevation of over 13,000 feet on the Continental Divide. Wetter, cooler at 12,700 ft.; warmer, drier at 10,000 ft. Temperature and precipitation logs from two stations at Niwot Ridge, one at 12,700 feet in elevation and a second at 10,000 feet, tell the story. The climate at the higher meteorological station is slightly wetter and cooler than in recent decades, while the station at 10,000 feet sits in a subalpine forest (less than five miles away and visible from the higher station) and is getting significantly warmer and drier. CU-Boulder Professor Mark Williams is the principal investigator on CU’s Niwot Ridge LTER site and co-author of “Long-Term Studies Detect Effects of Disappearing Ice and Snow,” one of the six papers in the BioScience series. Niwot Ridge is the highest long-term climate station in the U.S. and climate records go back more than 60 years. Williams said warming at 10,000 feet and lower may be causing enhanced surface water evaporation and transport that moves westward and higher in the mountains, with water vapor converting to snow that falls on the Continental Divide. With snowpack roughly half of normal in 2012, high country snow this year began to melt more than three months earlier than 2011. American pikas, found on alpine talus slopes, need heavy snowpack to insulate them from cold winters and are impacted by a changing climate. In lower, isolated mountain ranges in Nevada, researchers are seeing a marked decline in American pika populations. LTER study authors predict that microbes, plants and animals that depend on snow and ice will decrease if they are unable to move into areas of snow and ice at higher elevations. At the same time, less snow could cause deer and elk to move higher in altitude to browse. As the snowline moves to higher elevations due to warming temperatures, so will parts of alpine tundra.